No journey to Cambodia is complete without a visit to Siem Reap, gateway to the World Heritage-listed Angkor Wat temple complex. One of the most culturally significant destinations in all of South East Asia. Located just over three hundred kilometres north west of Cambodia’s capital Phnom Penh, Siem Reap is easily accessed via good roads in around 5 to 6 hours. For even greater convenience, the city boasts one of Cambodia’s three international airports with regular flights from Thailand, Singapore, Vietnam, Laos, Hong Kong and China. When water levels allow, you can also make the trip from Phnom Penh by speed boat in the same amount of time as by road. Or, take a leisurely cruise over several days. Once just a scattering of small villages on the edge of South East Asia’s largest lake, the Tonle Sap, Siem Reap, is now a thriving tourist resort. With a well-established range of restaurants, shops, art galleries, nightlife and a whole range of local activities and attractions, Cambodia’s 5th largest city is a now a worthy destination in its own right. Visitors can soak up the temples at their leisure while experiencing Cambodian culture in comfort and style. Diversity is the key in Siem Reap. Accommodation ranges from high-end boutique hotels to budget backpacker hostels and everything in between. Foodies will love an international smorgasbord of modern and traditional cuisines. Choose from a barbeque on the sidewalk or feast on Nuevo-European cuisine made by world-class chefs. The Angkor Night Market, right in the centre of town, has a food court offering a huge range of Cambodian, Western and Asian Cuisine. The centre of Siem Reap is easy to explore on foot, with plenty to see and ample opportunity to take the weight off. However, if you’re heading further afield, a ride in a tuk-tuk is a must do experience. While not luxurious by any standards, they are cheap, convenient and offer 360-degree views of your surrounds. Although Angkor Wat is the most famous temple site in Cambodia, the Angkor Wat Archeological Park encompasses many other incredible temples spread out over 400 square kilometers. Structures range from partially renovated temples, pagodas and royal residences, to recent discoveries that have been virtually untouched for half a millennium. Don’t miss the vast complex of Angkor Thom, including magnificent Bayon, nor the wild and beautiful Ta Prohm made famous by Angelina Jolie’s adventures in “Tomb Raider.” Dozens of other smaller temples, each with their own story, are also worthy of your time and attention. 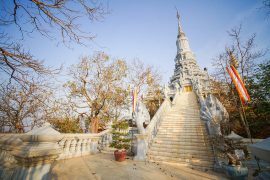 While you can visit the three top complexes in a single, jam-packed day, a grand tour of 3 or more days will give you a much better appreciation of the sheer scale and grandeur of the ancient Khmer civilization. An empire that once reigned over all of Cambodia, portions of Vietnam and China, and across the Bay of Bengal. While Angkor Wat and the other temple complexes are the big drawcards for visitors to Siem Reap, it would be a shame not to explore at least some of the many other attractions and activities available in the area. Whether you’re looking to get active, delve into the culture, get up close and personal with wildlife, or get in touch with your creative side, Siem Reap has plenty for everyone. 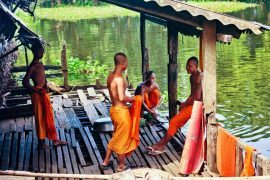 Explore the surrounding countryside and community villages to reveal the rhythm of daily life in Cambodia. For those who like a little more activity on their trip, cycling tours are a perfect way get off the beaten track. Adventure junkies will get an adrenaline rush from the Angkor Canopy Zipline, located within the Angkor Archaeological Park itself. The 21 stations are all nestled deep in the jungle. Towering trees, exotic flowers, beautiful fauna and native wildlife make this a once in a lifetime experience. Cruise on the mighty Tonle Sap to discover floating villages and flooded forests. Wildlife lovers shouldn’t miss Prek Toal Bird Biosphere Reserve which has been described as “the single most important breeding ground in Southeast Asia for globally threatened large waterbirds.” A sunset dinner cruise is a perfect way to end the day. Immerse yourself in nature on Kulen Mountain with its spectacular waterfalls, riverbed carvings and hidden temples. There’s plenty on offer for those who want to explore Cambodian arts and culture. Khmer handicrafts are practically irresistible as souvenirs, as are the wide range of traditional and contemporary art available in the many small galleries around town. If you time your visit right, you might also attend one of Siem Reap’s annual Photography, art and film festivals which takes place usually in December. You’ll find it almost impossible to leave without doing some customary shopping. The Angkor Night Market has around 240 shops selling traditional Cambodian-made handicrafts including clothing, silk, paintings, photography, jewelry, wood and stone carvings. Apsara dance is the most famous performance art of Cambodia. This elegant, classical dance was created by the Royal Ballet of Cambodia in the mid 20th Century. Many hotels have dinner performances. Witness a monk blessing ceremony or test your culinary skills at a Khmer cooking class. Siem Reap can be visited all year-round, with each season offering its advantage. Weather-wise, the area is driest from November through to March, with December to February being the most pleasant, for temperatures. However, this is also peak season which brings higher prices and more tourists so major sites can get crowded. In the wet season from May to October, most rain occurs during the afternoon, leaving ample time during the rest of the day to explore. Angkor Wat is particularly photogenic when the surrounding moat is full. Talk to a Green Cultural Travel advisor to plan either a guided or self-guided tour of any of these amazing sights and activities.